Click here to see in your browser. Director: Dr. Angel Borja, AZTI-Tecnalia (Spain). Coordinator of the European 7th FP DEVOTES project (Development of innovative tools for understanding marine biodiversity and assessing good environmental status). 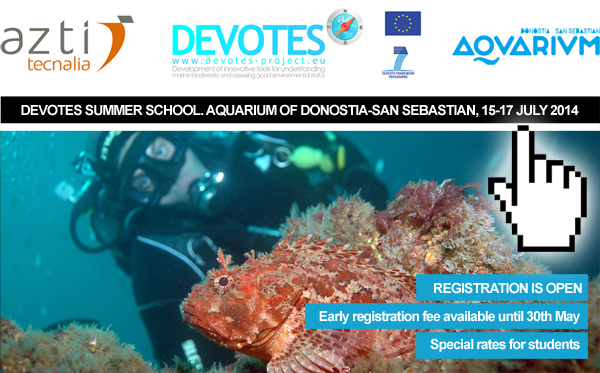 Objectives: This is the 11th AZTI’s Marine Research Division Summer School and the second one organized within the European FP7 project “DEVOTES” (Development of innovative tools for understanding marine biodiversity and assessing good environmental status), in which most of the teachers of this Summer School are involved. As in previous years, we want that attendees can acquire new knowledge on recent trends in marine research, related to management of our oceans. This Summer School will explore the potential and recent advances in the use of marine modelling (some of them developed in DEVOTES), at different scales (from species to ecosystems), in management applications, including scenarios of climate change. Hence, the main objective of the school is to give an overview on the marine modelling to ocean and coastal management, with a closer view to the European Marine Strategy Framework Directive (MSFD), especially in descriptors such as: biodiversity, fishing, food-webs and seafloor integrity. CANCELATION POLICY: If the notice of cancellation is received before the 11th July, the 75% of the fee will be refunded Cancellations after the 11th July are not elegible for refund. Pursuant to Spanish Organic Law 15/1999, 13 December, we inform you that the personal data you have given to us are included in a file called "Contacts", which AZTI-Tecnalia, with registered offices in Txatxarramendi Ugartea s/n, 48395 Sukarrieta, is responsible for. This file, containing information for the administrative and financial management of the services provided, advertising and trade surveys, it has been notified to the Spanish Data Protection Agency and has the necessary safety means to guarantee the total safety of the data. In any case, the interested party is informed and gives his consent both to the processing of his data for the purpose mentioned, and for transfer to companies that collaborate with AZTI-Tecnalia in order to improve the management of our services. We remind you of the possibility of accessing the data provided as well as of requesting, where appropriate, their rectification, opposition or cancellation, under the terms established by the aforementioned Law, sending a written communication to AZTI-Tecnalia.